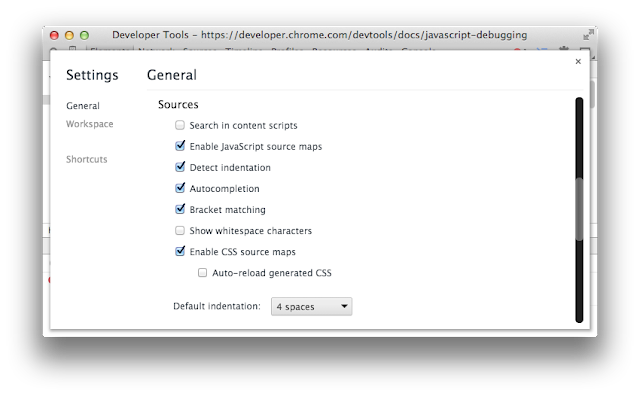 It would be probably better to bring these files to a CDN, like cdnjs, but CDNs are not really intended for source maps. Another option would be a PrimeFaces repository. We will see how to handle that in the future. 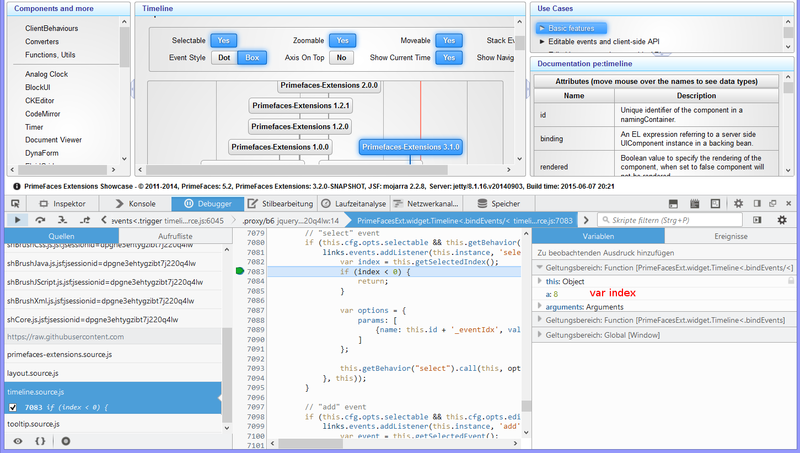 The next picture demonstrates how the debugging for the compressed JS file timeline.js looks in my Firefox. Due to the Firefox built-in source map support we see the uncompressed JS file timeline.source.js. I set a breakpoint on the line with the if-statement if (index < 0). After that I clicked on an event in the Timeline component. The breakpoint was jumped up. Now, I can debug step by step and see my local and global variables on the right side. As you probably see, the variable index is shown as a (I marked it red as var index). This is a shortcoming of the current source map specification. You can read this discussion for more details. Again, keep in mind - the source maps and original files will be only loaded when you open up the browser dev. tools and enable this support explicitly. If the dev. tools has identified that a source map is available, it will be fetched along with referenced source file(s). If a source map file is not available, you will see a 404 "not found message" in the dev. tool (not bad at all in my opinion). That's all. My next posts will be about AngularJS and less about JSF. Stay tuned. PrimeFaces Extensions 3.2.0 has been released! This is a maintenance release which is built on top of PrimeFaces 5.2. Closed issues are available on GitHub. pe:ajaxErrorHandler was removed in favor of p:ajaxExceptionHandler. It was buggy and not working in the prev. release. 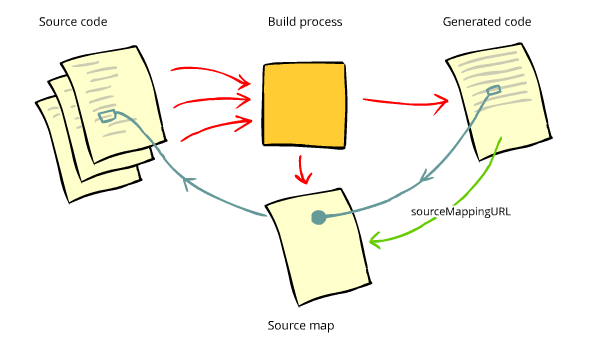 More info about source map is coming soon in my blog and the Wiki page of the Maven plugin for resource optimization. The deployed showcase will be available soon as usually at http://primefaces.org/showcase-ext/views/home.jsf.